Pro tip: When you're in the midst of awe-inspiring scenery, you should probably look up. I’m not proud of the fact that I spent last night watching “Below Deck” while intermittently flipping back to nail-biting election results, but it feels good to be honest: I spent last night torn between Bravo and George Stephanopoulos. For the uninitiated, “Below Deck” is a soapy reality-show version of “Upstairs/Downstairs,” in which viewers follow both the wealthy guests who booked a luxurious trip on a yacht to sail through stunning locales like Tahiti (this season’s destination) or the Mediterranean. And we also follow the crew that tends to the guests’ every need (in last night’s episode, the third steward was asked to fetch a coconut water with ONE blueberry, ONE strawberry slice, and if memory serves, ONE mint leaf). There’s much joy, much fighting, and the occasional hook-up; essentially, your basic reality-show format, but on a boat. 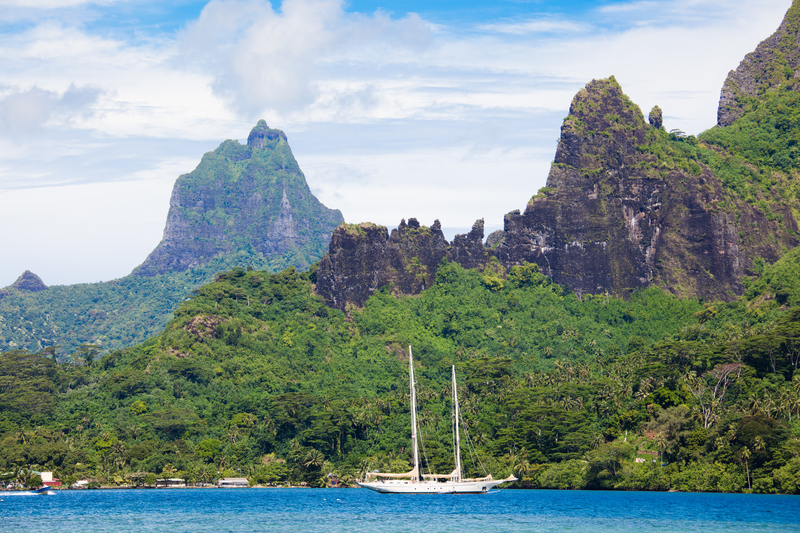 In last night’s episode, the yacht guests sail to Mo’orea, which I’ve never been to, but holy moly does it ever look gorgeous. They planned fun activities like a fishing trip and a floating lunch — a floating lunch, served in crystal blue waters, surrounded by stingrays and some type of shark that won’t eat you! Here’s how the guests on the boat experienced the awe-inspiring journey: They stared into their cell phones. The. Entire. Time. When a gourmet chef presented lobster and foie gras and a very tasty-looking steak, they checked their phones. When they were served fluffy, fluffy french toast on deck, surrounded by views that look like this, they conferred about the WiFi and how much power they’d have. And when they were docking, they did a photo shoot on the bow (making it rather challenging for the captain to see where he should dock). This phone-filtered relationship between yacht guests and their environment may actually be impairing their ability to remember their magical trip: Research led by Linda Henkle, Ph.D., a professor of psychology at Fairfield University, discovered something called “photo-taking-impairment effect.” That means when you are looking at something through your phone camera, rather than through your eyes, you remember less of what you saw. Every photo the yachters snap may actually be un-recording their memories of what they are snapping. My point is this: You don’t need to sail around Tahiti on a private yacht to see that there’s beauty all around you, but if you’re going to actually sail around Tahiti on a private yacht, for the love of Instagram, LOOK UP. Anne Sachs is Thrive Global's Chief Content Officer. Prior to joining the Thrive team, Anne managed a dual role at Condé Nast, where she served as both Executive Digital Director at W Magazine and the Editorial Director of Product Partnerships, working across product and content strategy. She also launched Conde Nast's Social News Desk, a central news hub for the company; served as interim Digital Director at Vogue; and was the Digital Director at Glamour. Before starting at Conde Nast, she worked in editorial for a wide range of brands, including ELLEgirl, MTV Networks, and The Gallup Poll.